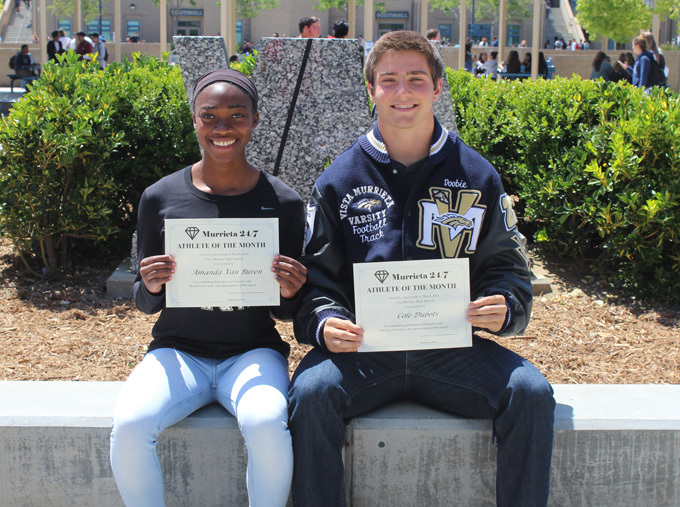 Cole Dubots and Amanda Van Buren of the track and field team are the Murrieta 24/7 March Athletes of the Month from Vista Murrieta High School, sponsored by Photos DLite photography studio. Dubots, just a junior, improved his personal best in the 100 meters to 10.63 seconds early this season. It stands as the sixth fastest time in the state this season. He also has the fourth fastest time in the 20 at 21.46. In addition, he is part of the 4x100 relay team, which has the state's fastest time, and the 4x400 relay, which has the second fastest time. Van Buren has the fourth fastest time in the state in the 10 meters at 11.70, just off her personal best of 11.68. She also has the state's third fastest time in the 200 (23.90). She will attend the University of Oklahoma and compete in track and field next year. She plans to study architecture. Anyone wishing to purchase a print copy of this article may do so by emailing murrieta247info@gmail.com. The April Athletes of the Month will be announced soon.